Happy birthday Vicki Cobb (Science Experiments You Can Eat), Matt Faulkner (Independent Dames) and Libby Gleeson (Half a World Away). Birthday greetings to fictional characters Hermione Granger of the Harry Potter series and Slimey the Worm from Sesame Street. It’s the birth date of Rachel Field (1894-1942), Hitty, Her First Hundred Years, Prayer for a Child, Calico Bush; Arthur Rackham (1867-1939) Arthur Rackham Fairy Book; Jim Haskins (1941-2005), Get on Board: The Story of the Underground Railroad, and William Golding (1911-1993) The Lord of the Flies. Mickey Mouse makes his screen debut in Steamboat Willie at Colony Theater, New York City, in 1928. I have been waiting for September 19 all year. It’s International Talk Like a Pirate Day! What an inspired idea for a celebration. Last year, all my Facebook friends went nutty with this one! I can hardly wait to see “Pirate speak” twitters this year. Pirate lore for children, however, tends to be a bit formulaic. After Robert Louis Stevenson’s Treasure Island and James Barrie’s Peter Pan set the parameters, most pirate books have followed a similar script. 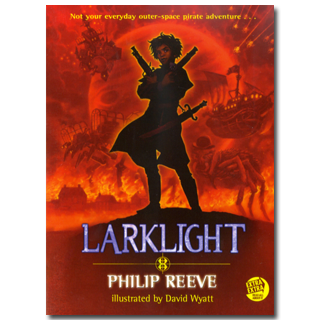 But not our book of the day, Larklight by Philip Reeve. In the fertile mind of the man who wrote The Hungry Cities chronicles, pirates have been combined with some surprising elements. The premise sentence for Reeve’s romp in the park, Larklight, would read simply: What if space travel had been invented when the British Empire was in full swing? Then they, and not those upstart Americans, would start colonizing space. This premise allows Reeve to combine alternate history, steam punk, real historical events, adventure, travel, and yes, pirates—not on the high seas but in space. At the beginning of the saga, Art and his sister Myrtle, the two narrators, live with their scientist father at Larklight, a space outpost just beyond the moon in the reign of Queen Victoria. When giant spiders attack their home and appear to have killed their father, Art and Myrtle flee—only to be rescued by Jack Havock, a space pirate who saves them from the vicious Potter moth. Jack has a grudge against the British Empire and travels with a makeshift crew of creatures from various locations in the solar system. But no peg leg for our boy; he even develops a crush on Myrtle. From there, the story careens from one exciting Star Wars-type chase to another until the band ends up trying to foil a mad scientist, intent on destroying much of the universe. They get separated and are brought back together again in a smashing finale! Literally smashing. For it turns out that the Crystal Palace of the 1851 Great Exhibition can walk and is being controlled by the scientist. However you celebrate International Talk Like a Pirate Day, I hope you will pick up this gem. In the children’s book field today, Philip Reeve is one of our most creative wordsmiths who always writes for his audience. You don’t want to miss him. And then, the boom of pistols and the clash of cutlass against spider claws began to echo down the stairwells from the hall, where Jack and the others were trying to hold off the boarding party from the First One’s ship. At the same moment we heard whisperings and leggy scrabblings emerging from the air shaft. The spider which Mother had bested must have climbed off to find reinforcements from among the other creatures left to guard our home, and now they were returning! Originally posted September 19, 2011. Updated for . Attention all good and true pirates helping sail this ship. If any son of a biscuit eater scallywag splashes any grog on yer blade about this website or Captain Silvey, don’t-cha be doin no shiver me timbers cause it be too noticeable. We be keelhauling the scurvy dog instead, until he be remorseful like, and then he kin be commentin on these here books, but we be eyeing the Sprog until he gits it all ship-shape and Bristol fashion me boys. He has to take an oath not to be loaded to the gunwales when he puts pen to paper here, cause if the squiffy goes too ripe on us lads, we’ll have to send him to meet Davy Jones. It’s perfect that you slot Mr. Reeve right next to Robert Louis Stevenson…. Both of them have the extraordinary ability to include JUST ENOUGH characterization, description, and detail to create a nuanced story where you really do care whether the adventures and the cliffhangers work out for the best … but never so much of those things that the story slows down even a tittle. Compare this with so many adventurey novels written today in which the action is swift but the characters are so thin and unsurprising that we don’t really care about their make-believe antics and quick escapes. Incidentally, for slightly older readers, or graduates of this delightful series, I’d also recommend his Hungry City Chronicles, and the prequel to that series released a year or two ago, FEVER CRUMB. Thank you for highlighting this series! It’s a cracking good read. Tobin: Yes Hungry City Chronicles are wonderful. Gordon: You have a talent for pirate speak! As many wonderful readers as this site has, surely there are more people with remarks today than from two famous authors, and one not famous hang-out poster. Grin..
your blog inspired me to place a sign outside my school library door announcing a themed book each day. I just discovered this site, and am going to follow it faithfully! Have you read Piratica, by Tanith Lee. Kate: I know Tanith Lee’s work, but not that book. Thank you! I was just wondering what to do with my 4th-5th grade class tomorrow. Such a tricky age to find books for but Larklight will be a perfect read-aloud. And they get to talk like pirates the whole time! Best yet, my library actually has it on the shelves.